Our hobbies are what got us started. Fitting them in around working 5 days a week. However, life changes and the passion for what you do as a hobby, takes life of its own. So now we create our different products full time. You may have seen us over the past 7 years at many of the local markets such as Eudlo, Palmwoods, Mooloolah, Kenilworth and Cooroy. Now you can buy direct from us online or contact us and you can make and appointment come as see us. At Hippyshack Creations we create handmade timber furniture and home wares. We have a range of handmade beeswax and scented soy candles, soap and lip balms. Also available paintings and functional art items. We are located in the hinterland of the Sunshine Coast in Queensland, Australia. A common question that we are asked is: Where does the timber come from? Our timber is sourced from logs retrieved from local tree loppers which saves this wood from being turned into chips. We mill the timber ourselves for our lovely timber furniture and home wares. Our soaps, candles and lip balms are all handmade and we like to source our ingredients from local businesses where possible. If you have a furniture or homeware item in mind, which we currently don't have, let us know and we can design and make it for you. 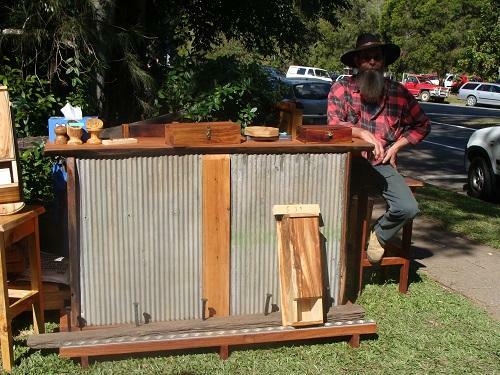 Hippyshack Creations can also supply you with timber if you wish to make something yourself. Please do not hesitate to contact us if you have any further enquiries.